Personally, I am not a fan of vegetable biryani. I mean, who needs it when you have a much tastier counterpart – chicken biryani! But since I am looking at cooking more and more diverse vegetarian dishes, I had to try this as well. In fact, my mom calls biryani a quick fix meal when we have guests but whenever I check for recipes online, the steps have always been long-wound and involve too much ingredients and procedures. 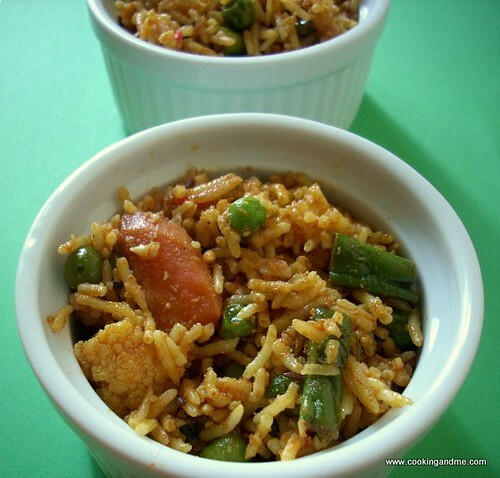 Here’s a quicker version of vegetable biryani in pressure cooker. The other day I was going through this old diary of mine that I used to write down recipes and cut out recipes from magazines, and I came across this biryani recipe. Sadly, I don’t have the source but I got the feeling it would turn out well. 1. Wash and soak rice for about 15 mins. Cook in an open pot with 3 cups water until the rice is cooked yet firm. Alternately, you can pressure cook for one whistle with one cup water. 2. Grind the ingredients for spice paste adding very little water. Meanwhile, cook the chopped vegetables in adequate water until cooked yet firm. 3. Heat oil/ghee and roast the fennel seeds, cardamom, cloves and bay leaf for about 30 seconds. Then add the onions and fry till it turns pink and translucent. 4. Add the semi cooked vegetables next and saute for 2-3 mins. Mix in the ground spice paste and fry till the raw smells leaves it. This shouldn’t take more than 5 mins. 5. Next add the curd (if using), red chilli powder, turmeric powder, lime juice and salt and mix well. 6. Turn off the heat. Add the cooked rice and mix gently until well blended. Serve hot with raita, papad and pickles. A super-quick version of this vegetable biryani recipe would be to do all the frying in the pressure cooker pan (spices, onions and ground paste). Add raw cut vegetables and washed, soaked rice to this. Pressure cook for one whistle in 1.5 cups water. This is what I mostly do but doing it the long way gives you more separated grains of rice and a stronger flavour. Looks delicious, I am sure it tastes good too. I am going to try and make it this week end.Thanks for sharing. malini – so glad you liked it 🙂 thanks for letting me know! Thanks for your recipe. You have a wonderful blog. A biriyani is one of those dishes on my “must-cook” list this year. Biriyani looks spicy & delicious Nags!!! my dad really makes the all time best veg biryani i have ever tasted – but nags you come rather close 😉 a lovely recipe! I do everything in cooker method:) That too in rice cooker…it wont get gooey anymore inspite of ur water ratio…cool! Looks lovely. throwing everything in the cooker? 🙂 ( I do the same in the rice cooker 🙂 )isn’t biryani an al time favorite? ha ha ha,throwing everything in pressure cooker and reading is my patent of cooking,now u too…tsk tsk tsk,haven’t heard of plagiarism huh?? I love Biryani. I too have about 3 version of making it. But I mmostly follow the easiest one which involves no grinding. my 2nd version is similar to yours. I bet, cooking the rice separately give it a better flavor. Biriyani Looks spicy and delicious! I can smell the aroma.. But Nags,your biriyani looks so yummy that i feel like having some right now..drools. Hi Nags, love your pic! I make it the last way, in the automatic rice cooker. I learnt the method from my mother who has always made vegetable biriyani that way. It is very quick and the rice stays separated too. Nags I can see that you have two new ramkins. I love vegetabble biriyani, but if i had the choice i would also fo for chicken one. The quick method is the one I always follow. Love your pics…. biriyani looks yummy nags. it looks nice and spicy.